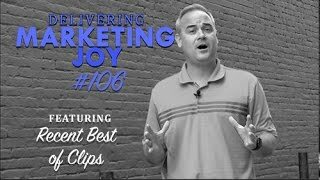 This week in Episode 107 of Delivering Marketing Joy!, Kirby interviewed Janet McMaster from Geiger. Janet shared three tips that all sales rock-stars have in common. In the video Janet discussed the best ways to help other people grow their sales. In order to make it as a sales person, you must believe in the industry you’re selling for and communicate this to your clients. Truly believe in the products you’re selling them; if you feel that the product isn’t all it is cracked up to be, people will figure it out. Make sure you bring value to your customers. This is critical when trying to ensure a repeat purchase. Janet stated that a sales individual needs to take a minute and determine their strengths and passions in sales. This will be easy for them to communicate to their clients and will convey their true excitement of a particular product. Sometime in this field, it is prudent to understand that not every customer is a good fit….you need to sometimes let them go. Kirby and Janet also discussed the industry changes throughout the last ten years, including topics ranthing from globalization to transparency. They also addressed what is now expected of companies because of the changes in industry. Want to keep up all the time? Make sure to join our VIP List! Our VIP’s get an email with the latest content…and other special offers as well. Join here.